Exciting live performances of classic rock & roll, rockabilly, and blues songs from a master of the style - enough for many nights of good rockin'. 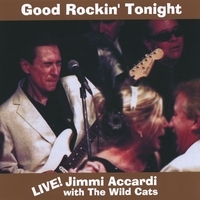 This CD showcases exciting live performances of classic rock and roll, rockabilly, and blues songs sung by Jimmi Accardi - backed up by his band The Wild Cats. This is the companion CD to "Live Jive! ", a collection of live originals. These are tried and true rockers that always get the crowd going. From nightclubs to festivals to concert halls to county fairs, everybody knows when this band shows up, there'll be "good rockin' tonight!" Jimmi's background includes touring as guitar player for Chubby Checker, Davy Jones and Micky Dolenz of The Monkees, and Eddy Dixon, and as lead guitarist and singer for The Laughing Dogs, Jimmi Accardi & The Wild Cats, and other bands; having his original music released on Columbia Records; licensing for film and television; and original songs in the Billboard Charts.